On July 3-4 the African Union (AU) held its 29th Annual Summit in Addis Ababa, Ethiopia while the continent is faced with monumental challenges from Cairo to Cape Town. Held under the theme of “Harnessing the Demographic Dividend through Investment in Youth”, the gathering recognized the necessity of economic and social development to ensure a prosperous and sustainable future for Africa. A recent decline in commodity prices impacting the raw materials, energy and agricultural producing states illustrates the need to plan for an independent strategy of guaranteeing the health and well-being of over one billion people. The two leading economic countries on the continent, South Africa and Nigeria, are both in recession. Unemployment is growing and the national currency of these states has fallen into precipitous decline. Bond rating agencies based in the United States are issuing reports which question the capacity of the ruling parties of each nation to engineer remedies that will make them more creditworthy to international finance capital. South Africa and Nigeria encompass growing youth populations placing social and political pressure on their governments to address the need for accessible employment opportunities for all. Nonetheless, the dependence upon foreign markets for the export of natural resources and cash crops systematically undermines strategic planning within the present world division of labor and economic power. Just three years ago western financial publications were hailing what they described as phenomenal growth in many African nations. The Federal Republic of Nigeria was proclaimed to have surpassed the Republic of South Africa as the leading power house of the region. Countries such as Angola, Algeria, Gabon, Nigeria and Ghana experienced an influx of foreign direct investment largely due to the rising oil and natural gas prices. However, by 2015, the prices of oil, natural gas and other resources had declined by over 60 percent. These factors compounded the social and political instability brought about as a result of the U.S. and NATO wars against the governments in Libya and Ivory Coast which resulted in the collapse of these societies fueling the migration from Africa across the Mediterranean and into Southern, Central and Eastern Europe. Similar western interventions in Iraq, Syria, Yemen, Afghanistan and the unresolved question of Palestine independence, has worsened the crisis of displacement. United Nations agencies have reported that the situation of dislocated persons domestically, as well as refugees and migrants, with estimates numbering 65-75 million people, easily surpasses any period since the conclusion of World War II. If these issues are not the focus of AU policy the future painted by Conde would not be a desirable one. A region so rich in minerals and land could further deteriorate making conditions unlivable to even larger numbers of people across the continent. These observations are poignant in light of the hostility that African migrants are met with in Europe and the U.S. The migration issue is being utilized by the ultra-right wing neo-fascist groups and political parties as a wedge to win political power and advance policies which reinforce racism and national discrimination against people from the former colonial territories of Africa, the Middle East and the Asia-Pacific. Although the AU mandated at its conception in 2002 the full integration of women within the governing structures of national and regional centers of power there is still considerable work to be done in this arena. In some countries women are represented in significant numbers within cabinet and parliamentary bodies, the civil service and professional fields. However, the onus of the declining economic situation, foreign intervention and internecine conflict falls upon the backs of women and youth. 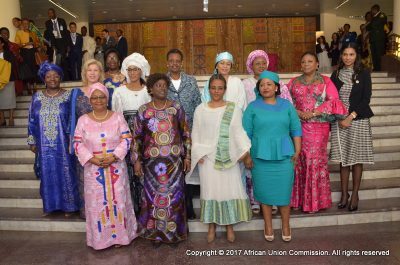 The 19th Ordinary General Assembly of First Ladies of Africa (OAFLA) took place simultaneously with the overall AU Summit. H.E. Ms. Amira El Fadil Mohamed, who is the Commissioner for Social Affairs of the AU Commission stressed that there is a pressing need for a systematic and integrated strategy aimed at tackling all four areas of the thematic demographic dividend pillars. These areas include health and well being; employment and entrepreneurship; education and skills development and rights and good governance. Without adequate progress in all four areas there cannot be long lasting growth, social stability and genuine development. Republic of Zimbabwe President Robert Mugabe followed through on a previous commitment when he served as AU Chairperson two years earlier. 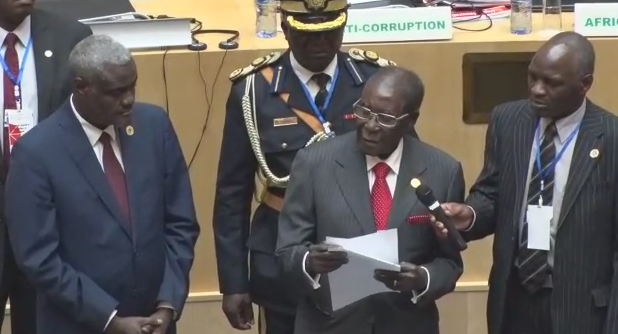 Mugabe presented a check for $1 million to the AU Foundation saying it was a “modest contribution” aimed at breaking the cycle of donor dependency. Zimbabwe and other anti-imperialist states had criticized the AU’s readmission of the Kingdom of Morocco earlier this year absent of the resolution of the Western Sahara question. Now both the Sahrawi Arab Democratic Republic (SADR) and their occupiers based in Rabat are members of the continental organization. Morocco has carried out a diplomatic offensive among the AU member-states. Its offers of economic assistance have swayed numerous governments to agree on a compromised position on the inherent anti-colonial mission of the organization. In the aftermath of the 29th Summit in Ethiopia, the Minister of Foreign Affairs for the SADR, Mohamed Salem Ould Essalek, convened a press conference in the Algerian capital saying that the AU would however deploy a task force to explore solutions to the Western Sahara crisis. The UN has gone on record calling for an internationally-supervised referendum on the future of the SADR. Nevertheless, Morocco continues to object to such an election claiming that the Western Sahara was an integral part of the Kingdom. During the early 1980s, the SADR was admitted as a full member of the Organization of African Unity (OAU), the predecessor to the AU. These decisions prompted the withdrawal of Morocco from the OAU/AU which lasted over three decades. It will remain to be seen how vigorous the approach of the AU will be in regard to winning national liberation for the SADR. The resolution of this conflict and other border issues is essential in building the necessary political trust that can move the continent towards full social and economic integration. Only a collective approach to genuine independence and sovereignty will lay the foundation for the realization of a functioning Pan-Africanism. Moreover, the AU member-states must transform their governing structures into truly representative institutions with the mandate of the workers, farmers and youth which can effectively break with the world capitalist system and move toward socialist reconstruction.